A new malware threat has been identified for Mac users, the app is called MACDefender and it disguises itself as antivirus software for Mac OS X. The malware attempts to install itself through hijacked websites, and the threat level is considered low, nonetheless all Mac users should be aware of the potential threat and take steps to avoid a potential problem. Launch the task manager tool Activity Monitor (located in /Applications/Utilities/) and click to sort processes by ‘Name’ and look for MACDefender or MacDefender.app – if this process is running, select the process and then kill it. Open System Preferences, click on Accounts, and select the “Login Items” tab, now look for MACDefender or any unusual entry in the list. If something is found, select it in and press the “-” button to delete it from the login item list. In the odd event that you have MACDefender and the above three steps did not remove the app, follow this guide to track down all login and boot scripts and applications, it may be hiding elsewhere although there are currently no reports of this. If you’re curious, you can read more about MACDefender and how it masks itself as antivirus software at Intego’s blog, they discovered the malware and they also happen to make genuine antivirus software for Mac. I bet we’ll see a security update to Mac OS X within the week to resolve this even though is is very low concern. It uses methods that work wonders on Windows users but it’s unlikely to have a serious impact on Macs. The scariest thing about it really is that it looks professional and then wants your credit card which will then be charged with who knows what. The simplest protection is this: don’t enter your administrator password unless you know what you are installing. You should highlight that this is not a security flaw in OS X…. 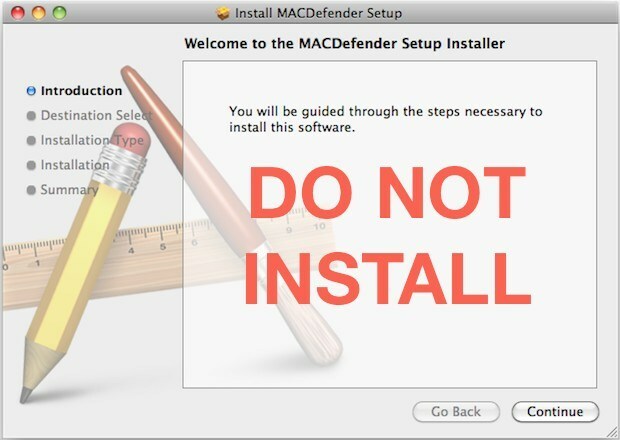 instead, it is an attempt to get a user to voluntarily install the Malware. My easy fix: I don’t use Safari.